I have recently been wanting a real keyboard for my iPad (2nd generation) to achieve faster writing. Then I spotted Logitech’s Ultrathin Keyboard Cover in a local store and decided to buy it even if I did not know about any reviews on it (later on I spotted many very positive reviews on it in the web). I can say that I am happy that I bought this keyboard. It is quite expensive one (99,95 €) but I think it is worth of that money. I like the idea that this keyboard works also as a cover for iPad’s screen. I have been using Apple’s iPad cover and wanted the keyboard to be similar in that respect and this one really is. This keyboard is very thin and do not add much thickness to the iPad when closed and covering the iPad. It attaches to iPad with similar magnet thing than the iPad cover. I would like those magnets to be little bit stronger though. I am somehow worried how those magnets will work after a year or so. Are they still strong enough to keep the cover in place when closed? The keyboard itself is fantastic. It is large enough for fast and accurate writing. It is about 20% smaller than my Apple Wireless Keyboard I am using with my Mac Mini. You’ll get used to this Logitech’s keyboard very easily. Also the writing feel is very good. And it is silent too. I think this is a needed feature if you are going to use a keyboard in meetings for example. 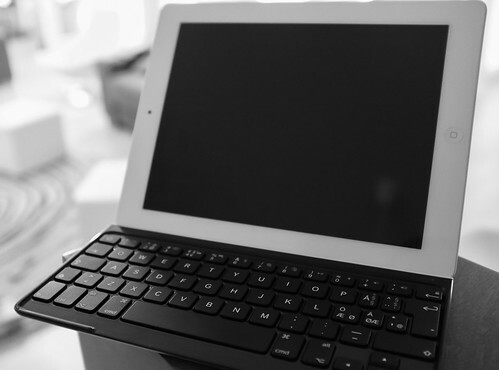 This keyboard have a very nice finish (aluminium outer shell) and a magnetic groove where the iPad is placed. The iPad is always in a fixed viewing angle (60 degrees) which could be problem for some users. I feel it is totally okay on table and even on my lap. iPad is staying very firmly in that groove and it is even possible to lift the whole combo by grabbing the iPad when it is in the upward writing position. If you write a lot (or even not so much) I really recommend this keyboard for your iPad. I use it now always because it doubles as a iPad screen cover and in that way it will be always with my iPad.